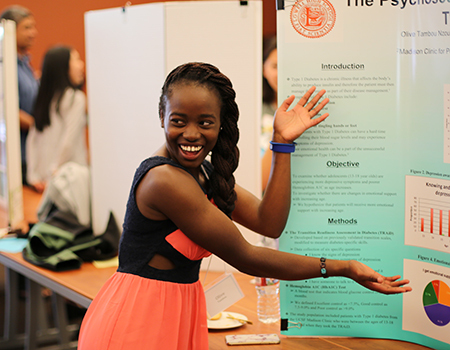 High school student Olive Tambou presents her poster on diabetes. By any measure, HIP has been a tremendous success. Nearly 100% of HIP alumni, many of whom were the first in their family to pursue higher education, attend college. Of those, three-quarters major in a scientific field and 90% go on to attend graduate or professional school (including at UCSF). In 2011, President Obama recognized HIP’s achievements with the Presidential Award for Excellence in Science, Mathematics, and Engineering Mentoring. Roel Marania presents his work to EVCP Daniel Lowenstein. 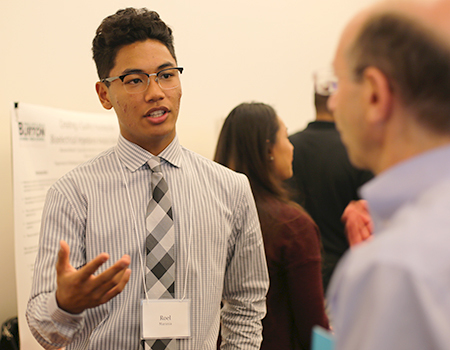 Last week, the 26 students in the 2016 HIP cohort presented the results of their eight weeks of lab work at a celebratory poster session at the Mission Bay Conference Center. The interns excitedly shared their findings on everything from subtypes of pancreatic cancer to specification of immune cells with their mentors, family and friends and SEP staff. A number of HIP alumni were also in attendance. 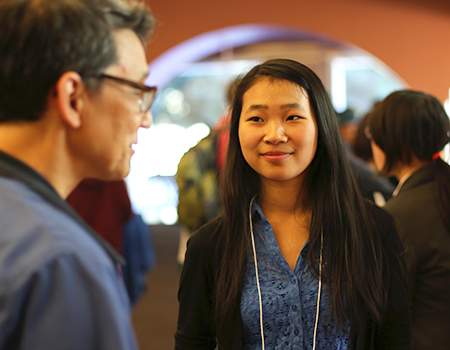 Jennifer Li, a 2014 HIP intern and current chemistry major at UC Davis, has continued to work in James Fraser’s lab every summer since participating in HIP. She mentioned that the program, and her subsequent experience working in the Fraser lab, has given her more confidence in presenting and learning, as she’s become more willing to ask questions. One of the more unique aspects of HIP is that the application process begins with the prospective intern’s nomination by a science teacher; students cannot apply without a nomination. 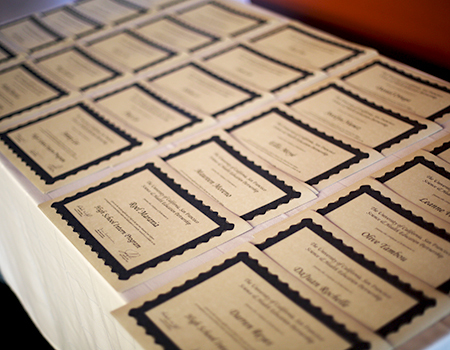 Katherine Nielsen, a co-director of SEP, points out that the nomination process allows HIP to reach out to deserving students who initially may not believe in themselves enough to consider applying, but with the nudge of recognition provided by a teacher’s support, will pursue a spot in the program. In addition to the exposure to a professional scientific setting, HIP also supplies interns with access to a college counselor, Michelle Channel, who thoughtfully helps students consider what they want to get out of college, and how best to convey their goals and desires in a personal statement. In his keynote address, Executive Vice Chancellor and Provost Daniel Lowenstein made an impassioned plea for the HIP participants to excel in college and come back to UCSF to help increase the diversity of perspective in healthcare, research and education at the university. To students and their families, he said, "We need you." 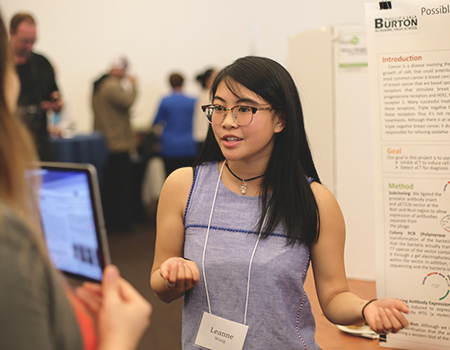 Leanne Wong shares her research. Selena Li at the poster session.